Born in 1549. Ordained a priest in the Franciscan Order at age 27. Left Spain for Peru in 1589. Labored among the Indians of Peru as a missionary for 20 years. Died in the year 1609. Feast day is celebrated on July 14. First converts to Catholicism. The person mainly responsible for an exemplary Christian life was a certain Frenchman – John Corbine. There were occasional visits by Missionary Fathers from Bayfield, Wisconsin. Small log cabin church was begun. Church was completed and blessed in August. A school and Sister’s Convent were built. Dominic Durharine, a Catholic layman, was the first teacher. The School Sisters of St. Francis from Milwaukee, WI, came to teach in the school until 1908. Sisters of St. Joseph from Superior, WI, took charge of the school until 1920. School was closed for lack of funds. Father Philip Gordon, diocesan priest and first American Indian priest, became pastor. The Church was destroyed by lightning. Present Church was built of native pipe stone. The School Sisters of St. Francis returned and reopened the school with Sister Sirilla LaRush as principal. She was the first native Indian religious from St. Francis Solanus Mission. New home for the Sisters was built. Franciscan priests from the Sacred Heart Province of St. Louis, MO, returned and took charge. A new school building was erected and blessed by Bishop William O’Connor on May 11, 1942. Grotto of Our Lady of Lourdes constructed as a Marian year project. Blacktopping of playground and parking lot. Playground equipment installed. Church tuck-pointed and bell tower repaired. Wigwam Repository constructed (21 deer hides). Interior of church redecorated. New garage for buses. Automatic Church bells and Angelus bells installed. Blacktopping completed; new playground equipment added. Re-shingling of Church roof and rectory kitchen addition. Green van for transporting 11 school children. New well dug and indoor plumbing for the school. New dry wells for the Mission. New epoxy glass windows for the church and convent chapel. Kindergarten begun in school. New 60 passenger school bus for the school children. New garage for Sisters. Lightning rods installed on roofs of all mission buildings. New lawn mowing equipment and snow removal equipment. New maroon van for transporting 11 school children. Extensive repair job on school to prevent basement leaking. Dishwasher equipment for school. Cross on Church steeple repaired. New organ for church in May. Original statue of Blessed Kateri Tekawitha in church. First computers in school. New 65-passenger school bus. Memorial erected in honor of Rev. Kurt E. Buranich, O.F.M. (died Dec. 25, 1983). Emergency generator installed for entire Mission. New 21-passenger school bus. New cemetery land cleared. Centennial of the school. Centennial celebration on June 9, 1985. New windows in school. Classroom painted. New furnace in school. New windows in convent. Cross in new cemetery erected. New drain filed for school. Electrical rewiring of school. Blessed Kateri Tekawitha statue in school cafeteria as a memorial to honor Sister Sirilla LaRush, Native Indian religious from St. Francis Mission. Diocesan priest, rev. Gregory Hopefl, became pastor. New windows in Convent. Church roof repaired. Inside walls of church repaired. Exterior of Convent painted. Roof repair on rectory. Interior of Church painted and carpeted. 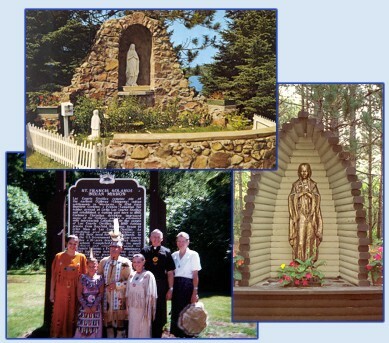 Outdoor shrine of Blessed Kateri Tekawitha constructed across from new cemetery. Playground equipment moved to present location. New 15-passenger (1993) school bus-van donated. Extensive school furnace repair. Construction of multi-purpose parish hall. New 15-passenger school bus. Blacktop sealant on parking lot. New roof and siding on school. Lumen Christi Award presented to Sister Felissa Zander. Installation of the Internet in school. New roof and siding on Convent. New roof and siding on Rectory. St. Francis Solanus Mission Historical Marker erected. Installed new generator for entire Mission from Clemson University, S.C.